Mustard like leaf used as a green salad and quickly becoming very popular. Tender, young leaves with a robust, peppery flavor add a pleasant accent to tossed salads. Cook mature leaves with other greens to add a pleasant taste sensation. 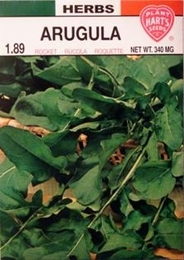 Late summer plantings of Arugula will yield a fine fall crop. Frequent cutting will encourage continuous growth and tender foliage. Pull plants in summer before they bolt to prevent self-sowing. Planting time - Early spring to late summer. Thinning - when plants are 2-4 inches tall thin to 12-18 inches apart.